Skin lightening treatments take weeks or months to make a significant difference. However, popular plant remedies can make your skin color and blemishes appear lighter and brighter in just a few days. Based on the science, these methods lighten your skin by reducing the amount of melanin present, and by encouraging new cells to replace duller, old cells on the skin's surface. Professional facial cosmetic procedures can also lighten the appearance of your skin in three days. Allow extra time to complete your morning remedy if you work, go to school, or have other morning commitments. You will also need extra time to devote to your evening routine before bedtime. Start day one with the following Lemon Juice Facial Scrub to exfoliate old cells from the surface of your skin and encourage new cells to come to the surface. The vitamin C from the lemons penetrates to deeper layers. Squeeze the juice of half a lemon in a small bowl. Add and mix in one tablespoon salt or brown sugar. Mix in one tablespoon coconut oil. Cleanse your face or other treatment area and pat dry. Apply the exfoliator mixture to your face for two to three minutes taking care to avoid your eye area. Leave the scrub on your face for 20 to 30 minutes, which allows the vitamin C time to penetrate the skin to the deeper cells which make melanin (melanocytes). Wash off with warm water and pat your skin dry. To avoid irritation, exfoliate your face only once during this three-day treatment. You can use this scrub daily on other hyperpigmented areas of your body, however. After you finish with your facial scrub, apply this toner to your skin and be sure to avoid your eye area. 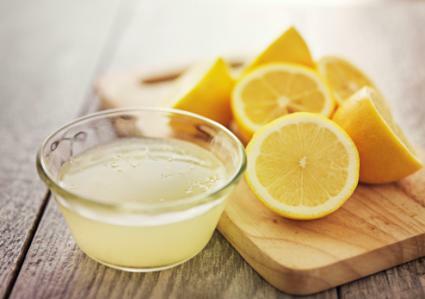 Cut a lemon in half and squeeze the juice of one half into a small bowl. Use a cotton ball or cotton pad to spread the juice on your face or pigmented spot. You can, instead, just rub the cut side of half a lemon gently into your skin. If you have dry skin, you can mix in a tablespoon of honey, or two tablespoons of milk or yogurt, and use as directed above. This skin lightening moisturizer combines the effects of vitamin C in lemon juice with that of aloesin in aloe vera on melanin content in the treated skin. After your facial scrub and skin toner treatment, apply this moisturizer. Scoop half a tablespoon of gel out of a fresh aloe vera leaf and use a spoon or fork to soften it in a small mixing bowl. Squeeze the juice of half a lemon into the bowl and mix with the aloe vera. Add half a teaspoon of sweet almond oil and mix well. Add only a drop or two of this oil if your skin tends to be oily. Gently massage a light layer of this mixture into your skin as an all-day, leave-on moisturizer. After 15 minutes, if your skin feels too oily or sticky, lightly blot your face with a cold damp washcloth or cotton pad. Finish off with a sun protectant of at least 30 SPF and your makeup routine and you are ready for the day. Do not apply a foundation to your skin. If you cannot get the aloe vera leaf, you can use bottled 100% aloe vera gel. Reapply the leave-on Aloe vera-Lemon Juice moisturizer twice during the day for best results. Make an extra portion of the toner and moisturizer in the morning or night before and bring it with you in small cosmetic jars if you are leaving home for the day. Gently wipe the cleanser residue off with a Lemon Juice Toner-soaked cotton ball or pad and let dry. Massage in a light layer of the Aloe vera-Lemon Juice moisturizer and reapply a sunscreen. Thoroughly cleanse your face of the day's products with a mild skin cleanser in preparation to begin an evening skin lightening treatment with a Licorice Powder-Tomato Paste Mask. Licorice powder is used in Asia as a skin lightening agent and, like lemon juice, tomatoes are loaded with vitamin C. In lab studies, the licorice substance glabridin interferes with melanin production. Crush a ripe medium tomato with a fork to form a paste. Add two tablespoons licorice powder and blend well. Stir in the juice of half a lemon and mix all into a soft paste. If you have dry skin, use a tablespoon of honey or four tablespoons of milk instead of lemon juice. Apply the paste in a thick layer to your skin with a medium cosmetic brush or your fingers. Let dry for 20 to 30 minutes. Gently scrub off the paste with a damp washcloth, then wash off your skin with warm water. Another option in place of the tomato-based mask is this one which is made with turmeric. Tumeric is easy to find in your local supermarket. The root is popular in Chinese and Indian cultures for cooking and treating pain, and women use it for skin lightening. Tumeric contains curcumin, a compound with antioxidant properties and affects substances that regulate melanin production. Pour two teaspoons lemon juice in a small bowl and mix in half a teaspoon turmeric powder. Crush half a cucumber in a separate bowl and mix two teaspoons of the cucumber juice into the turmeric mixture to form a paste. Apply, let dry, and remove as you would with the licorice-tomato mask. Apply the morning Lemon Juice Toner to your face with a cotton ball or pad and leave on for 20 to 30 minutes. Wash off the toner and pat your skin dry. Gently massage in the Aloe Vera-Lemon Juice Moisturizer and leave it on for the night. Wash your face with your mild cleanser. Apply the Licorice Powder-Tomato Paste or Turmeric Mask and leave on for 20 to 30 minutes. Wash off the mask with warm water and pat your face dry. Apply the Lemon Juice Toner and let it sit on your skin for 20 to 30 minutes as you did on the morning of day one. Wash off with cool water and pat your face dry. Gently massage the all day leave-on Aloe Vera-Lemon Juice Moisturizer into your skin. For your day and evening routines, follow the rest of the plan outlined for day one. Apply a small amount of the Licorice Powder-Tomato Paste or the Tumeric Paste Mask to the area of your blemish. Leave on for 20 to 30 minutes and wash off with warm water and pat dry. Apply the Aloe Vera-Lemon Juice Moisturizer mixture to the blemish and leave on. Similarly, you can lighten large areas of hyperpigmentation other than your face, such as on your armpits, arms, hands, legs, feet and bottom with the same mixtures and method. Another armpit skin lightening option is to use potato slices. A potato contains an enzyme called catecholase, which is similar to tyrosinase and inhibits its action in the skin, leading to decreased melanin production. Wash a potato and cut off a slice. Rub the slice gently on your skin to apply the juice to the armpit. Let dry 20 to 30 minutes. Rinse with warm or cool water. You can also grate half of a small to medium potato, including the skin, and use the gratings to massage your skin. This is a good method to treat your darkened underarms. 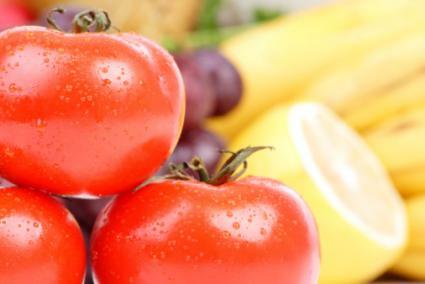 Research shows vitamins and other antioxidants from certain fruits and vegetables reduce melanin production and its transport to the top layers of the skin. 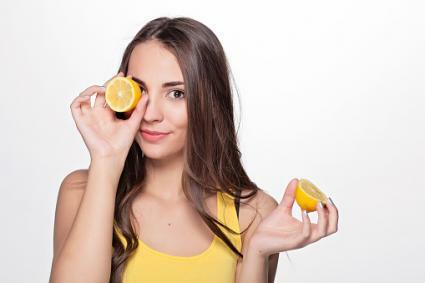 For example, lemons, a popular natural skin lightener, contain the powerful antioxidant vitamin C (ascorbic acid), which has several functions in skin. Vitamin C lightens skin by inhibiting tyrosinase, the first enzyme on the pathway to melanin production. Other plant life also has various chemicals that interfere with melanin production or transport. Putting the science and users' experiences into action, try the following three-day home routine to brighten and refresh your face or lighten facial blemishes. You can also use these natural mixtures on other areas of hyperpigmented skin in such places as your underarms, hands, arms, or legs. Stop the routine if your skin gets irritated or you develop a rash. Avoid or limit your sun exposure during treatment as natural plant agents such as vitamin C can increase your skin's sensitivity to sun, and can cause phototoxic or photo-allergic reactions. In addition, you want to protect your skin from darkening in the sun. Over-the-counter skincare products can also lighten your skin. However, it will be weeks or months before you see results. Try a professional skin resurfacing for a quicker visible result. A light chemical peel with professional-strength alpha hydroxy acids (AHAs) refreshes and brightens your skin quickly by removing old surface cells. Find a dermatologist or other trained skincare professional to do the procedure. Because this is a non-invasive, superficial peel the skin should heal in about three days. A superficial facial laser resurfacing can make your skin look lighter and younger. Your skin will heal in three days if only the top layers of skin are treated. The procedure can also remove acne scars and treat wrinkles and sun damage. See a dermatologist or plastic surgeon for this treatment. Once you achieve your goal, continue with this routine at least two or three times a week to sustain the decreased melanin content in your lightened skin. For best results during and after initial treatment with natural remedies or professional skin procedures, it is also important to stay out of the sun or use a sunscreen of at least 30 SPF to prevent sun-damage and recurrent hyperpigmentation.